No matter how tasty the food is in our dining hall, you will get tired of it eventually. While cooking in the dorm could be a headache especially when you don’t have a large kitchen, some simple snacks could always be nice choices. 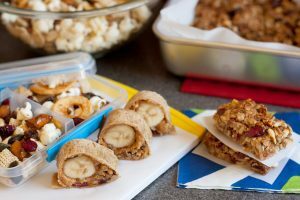 For those who just love sweet stuff so much, but don’t want to lose themselves in the world of donuts, cupcakes and giant chocolate cookies, here’s a smart and satisfying idea— Banana Sushi. There are many different versions of Banana Sushi and you can even create your special flavor. My personal favorite is PB+ Greek Yogurt (and there are choices of different yogurt flavors). 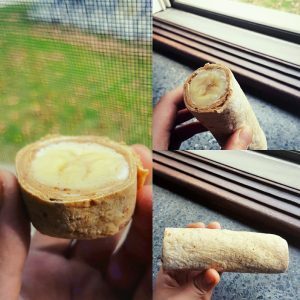 One tip to make it a perfect summer treat: Wrap it in plastic wrap and freeze it for 1-2 hrs, and it becomes a Banana Sushi Popsicle! Here is a video of the basic version. *Recipe modified from Lidia Simic’s Banana and Nutella Sushi.